100,000 passengers have already been on the British Airways i360 since it opened just three weeks ago along Brighton Seafront. The super-slim tower is already a record breaker as it's officially the thinnest tower in the world at 450 feet in the air. 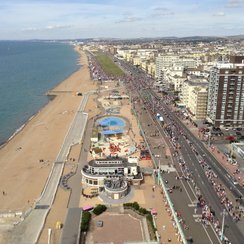 British Airways i360 welcomed its 100,000th passenger on board a flight to 450 feet above Brighton this weekend [August 29], just over three weeks after the attraction opened. The world's first vertical cable car, conceived and designed by London Eye architects Marks Barfield Architects, has already met its summer visitor target, attracting huge crowds, Heart Breakfast broadcast their show live from 450feet in the air the day it opened on August 4. David Marks, Chairman of British Airways i360 says "We are delighted to be on target, hitting this enormous visitor figure in such a short time this summer and we expect to build on this with the start of our events season in our stunning beach level venue starting this week,"
Eleanor Harris, CEO of British Airways i360, said, "Reaction from the public has been overwhelmingly positive and so far we are running 10 percent over our budgeted visitor numbers. 6,500 local residents have already signed up as members and we have also welcomed hundreds of journalists from around the world, including Australia, USA, France, Germany, Finland and many more countries." Cllr Gill Mitchell, deputy leader of Brighton & Hove City Council, said, "We are delighted that British Airways i360 is already proving to be so popular and is attracting visitors from far and wide as well as helping to build Brighton & Hove's fame across the world."